Get your hands on the Legendary Sword, Shield, and Armor. 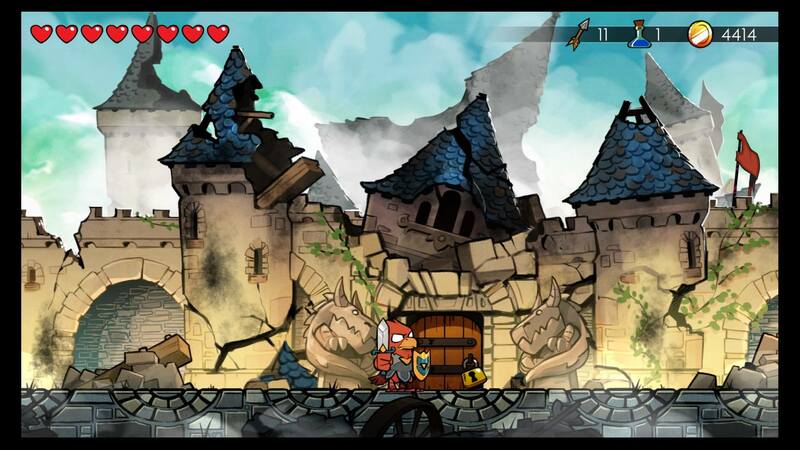 Hidden away in Wonder Boy: The Dragon's Trap is a set of gear that can help substantially if you're trying to make your way through the end of the game. The final dungeon can be a bit of a pain, due to how long and packed with enemies it is, so every little bit helps. What better way to get an extra edge than to collect the aptly named Legendary gear? While these don't provide any specific special effects, they do each boast very solid stats on all forms. To get them, you'll need to have unlocked your Hawk-Man form. For specifics, read on. To nab yourself the Legendary gear you'll need to take the form of Hawk-Man and fly right from town. Just to the right of the town is a little shop hidden away that you'll want to head into and buy a key for a couple hundred coins, then continue flying right until you've reached the castle where you entire journey first began. Use the key you bought to open the main entrance and fight your way through the castle towards where you fought the Meka Dragon. This time, instead of a boss battle, you'll find a chest with your Legendary Sword that you likely dropped when you became Lizard-Man. Leave the boss room and head right as you did when you were escaping the castle as Lizard-Man, but make sure to kill everything along the way. As you reach the end of the catacomb looking area you'll stumble upon a yellow cyclops, and killing him should net you the Legendary Armor. Finally, continue along the path to bounce your way out of the castle, which should leave you inside of the well just outside of the castle. Hidden here is the final piece of gear. Stand in the well and hold Up to enter a door that will take you to a new shop. The pig here will sell you the Legendary Shield, which he found in the rubble, but it ain't cheap unfortunately. You'll need almost 6000 gold to buy it off of him. Grabbing all three of these pieces should help give you the boost you need to make your way through Vampire Dragon's treacherous lair and reclaim your true form. Good luck! Looking for more rad Switch games now that you've wrecked Wonder Boy? Check out our Best Switch Games list.